Storage is always an issue with children’s rooms. Toy clutter drives me crazy! Way Basics offers a unique, green solution for storage and organizational challenges. Made from recycled paper, not a single tree was cut down to make this eco furniture. We all need that box to just throw all our stuff in and cover it up. 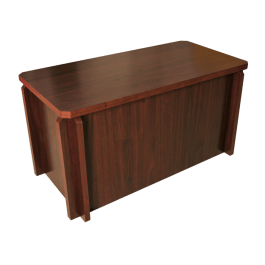 The Manhattan Storage Bench and Table is the perfect unit to organize and conceal all your things. Assembly gets even easier in this 5 piece unit. Simply slot the 4 walls together and the top lid has 2 stick-on brackets that holds it in place when covering the base. The Manhattan is multi-functional as a storage bench for the garage, entry way, sandals, and you can even sit on it to put on your shoes. Live in a small space, it’s also a great coffee table or laptop desk in front of the couch. What will you organize it with? At first, I was a little confused as to how to put the bench together, as the directions seemed to be for all of the different products Way Basics make. By looking at the pieces and the last picture on the directions, I figured it out quite easily. It went together in less than five minutes with no tools or glue. I do not like the espresso color I picked out. It looks too much like fake wood and reminds me of the mdf veneered stereo cabinet I had as a kid. Fortunately, this is not made of mdf. It is made from truly sturdy cardboard and not particle board and toxic glues. I do think this peice would be nicer in one of the colors rather than the fake wood grain I chose. There is no bottom to this chest, which is fine, but something to note. I do like how the lid is lightweight making it easy for kids to maneuver. My kids like to hide inside our Manhattan Bench. I don’t know how long this bench would stand up to the test of rough and tumble kid usage, but I like how no trees were cut down to manufacture it. When it does reach its end life, we can simply recycle it with our other paper products. I really appreciated your last line. “I don’t know how long this bench would stand up to the test of rough and tumble kid usage, but I like how no trees were cut down to manufacture it. When it does reach its end life, we can simply recycle it with our other paper products.” the finishing of table is really good I think no one can judge its made from paper or wood. This was really made out of recycled paper? Amazing! It looks like real wood.